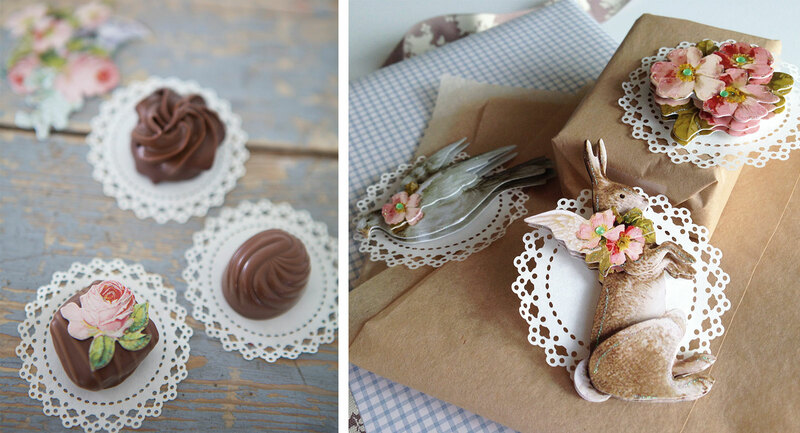 We made these adorable mini doilies knowing we would love them, hope you do too. Here are some ideas on how to use them. They are great under chocolate confectionery for special occasions, or a mini doll cake perhaps. 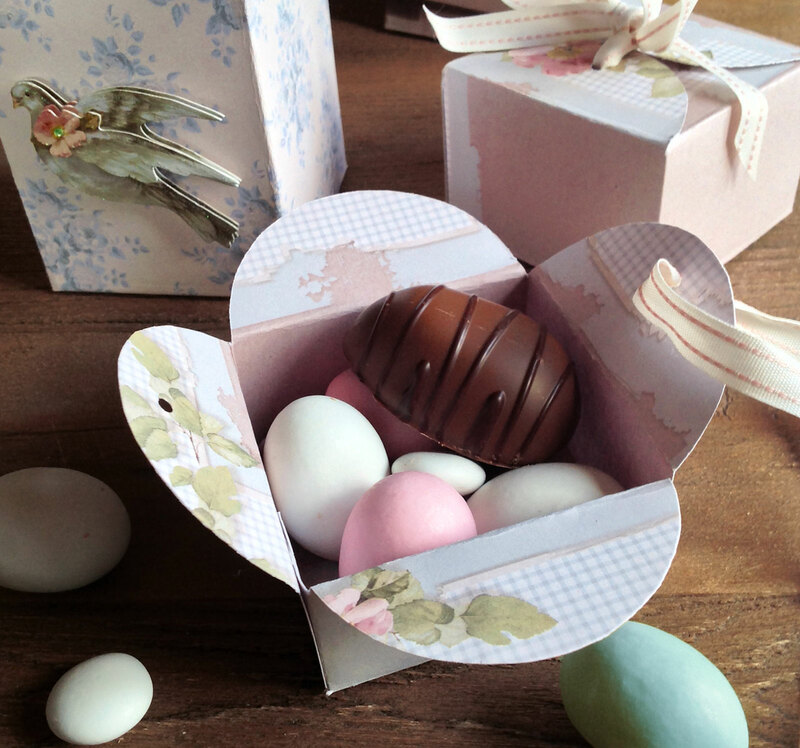 Sweet behind a small sticker or scrap when decorating your gifts or cards. 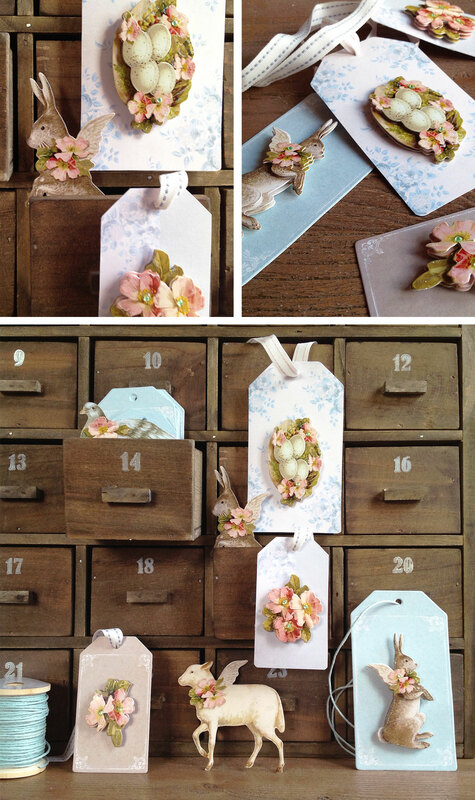 And they make cute little garlands to decorate your room, or as a cake garland. 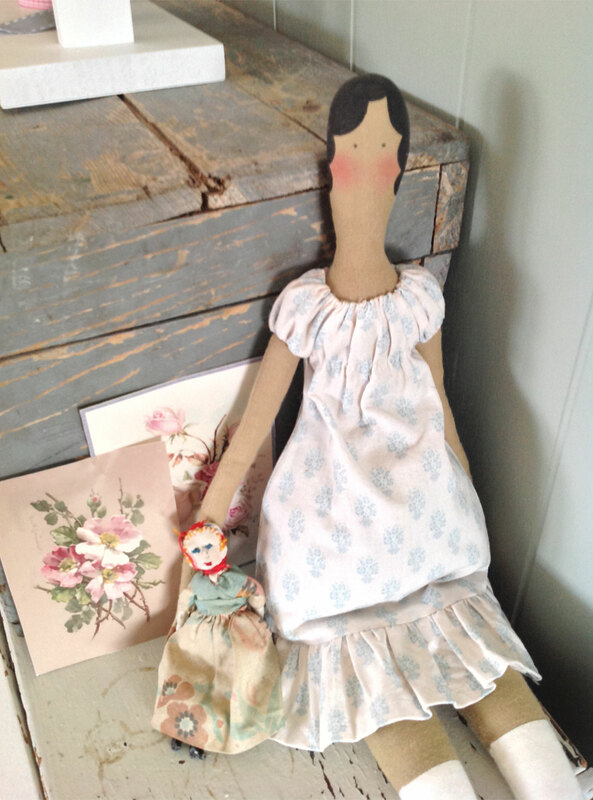 The new sewing kit this spring is a hare mother and daughter ready for warmer days in their vintage spring dresses. For those of you not familiar with Tilda sewing kits, they contain instructions in seven languages, pattern and materials. In addition to the materials you find in the kit, you will need filling, and materials for eyes and rosy cheeks. You should always use a sewing machine when making sewn animals and dolls, and have a good small scissor and an iron at hand. If you plan on sewing more Tilda figures we suggest getting the Tilda Painting Faces kit. 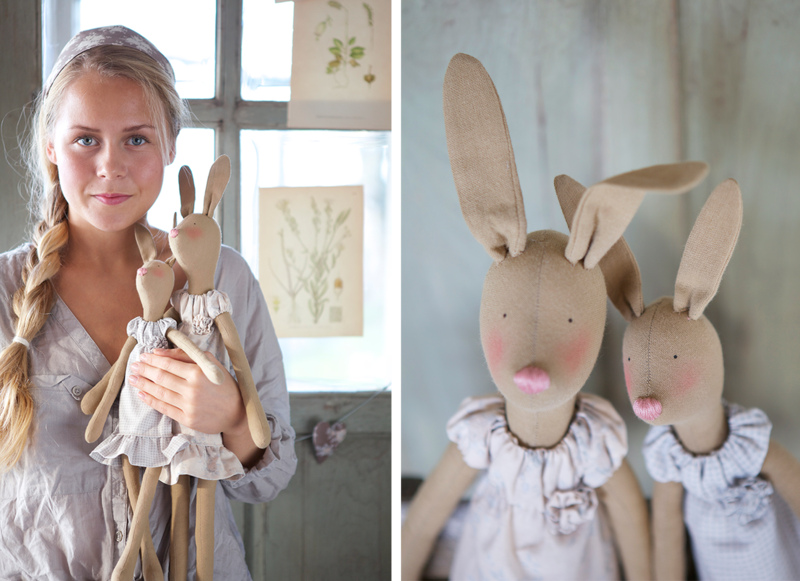 The hares work well as cute easter and spring decorations. Need a weekend project? 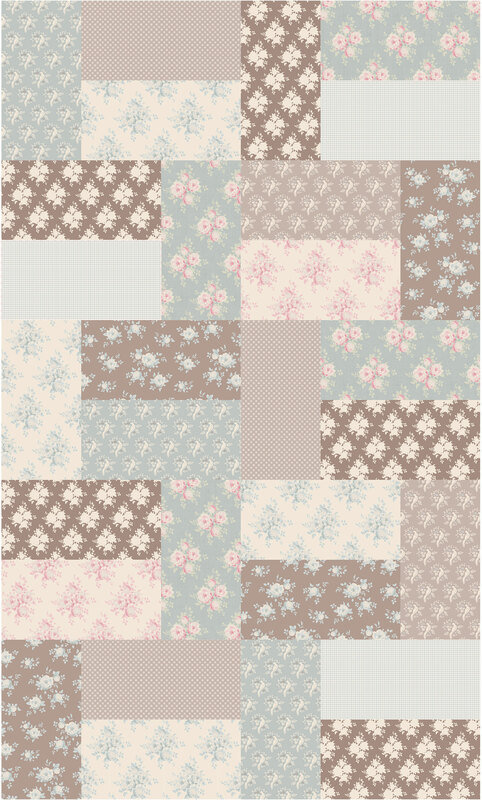 The soft colored “All that is spring” fabric is perfect for a simple and relaxing weekend quilt. 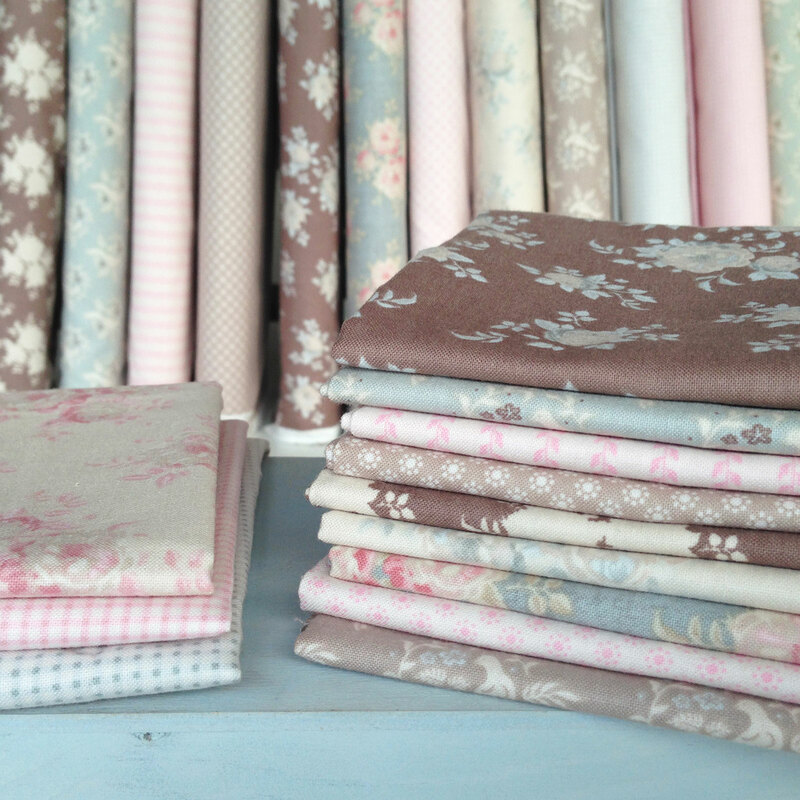 We have used seven of the “All that is spring” fabrics (right side) the new basic “Gingham Blue grey”, and “Mina pink” from the “Summer Fair” collection. The pink and white fabrics will work well if you want a lighter and more feminine quilt. 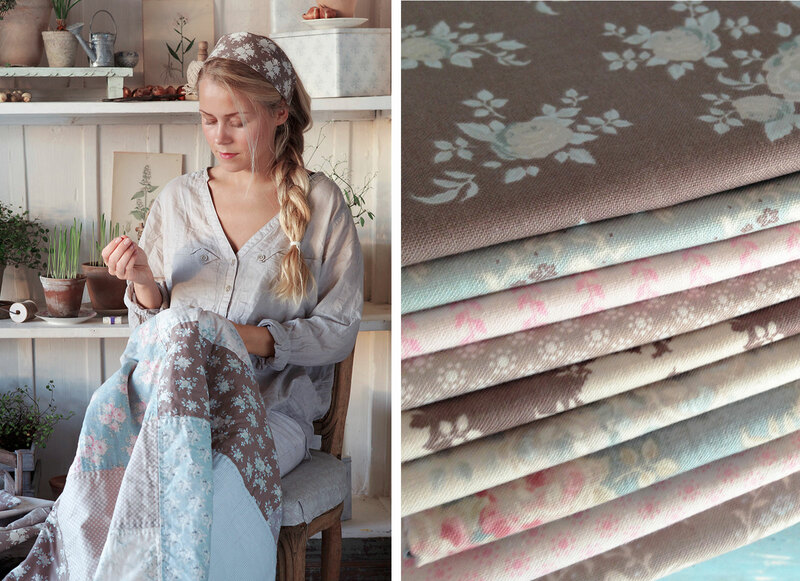 For the backing you can use one of Tilda’s 140 cm wide solid colour fabrics. The quilt is made out of large rectangles, 20 x 40 cm + seem allowance. 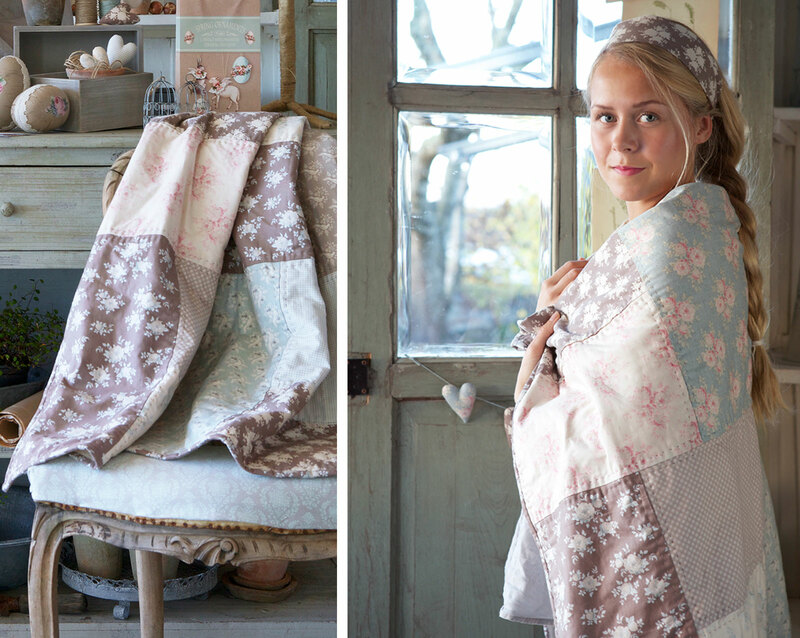 Here is how you can piece your quilt top together to make a quick and easy 120 x 200 cm quilt. We always use cotton batting for cosy quilts like this one, and recommend basting spray instead of hand or pin basting if you want to save time. There are a number of basting sprays available, and tutorials on how to spray baste your quilt on YouTube. Spray baste is a fabric glue spray, and it is important not to use to much, especially if you are going to hand quilt. Make sure you have a sharp needle at all times. When you have spray basted your quilt you can hand quilt without worrying about the layers moving. This quilt is simply hand quilted approximately 1,5 cm from the edge around each rectangle. We recommend using a strong thread intended for hand quilting. 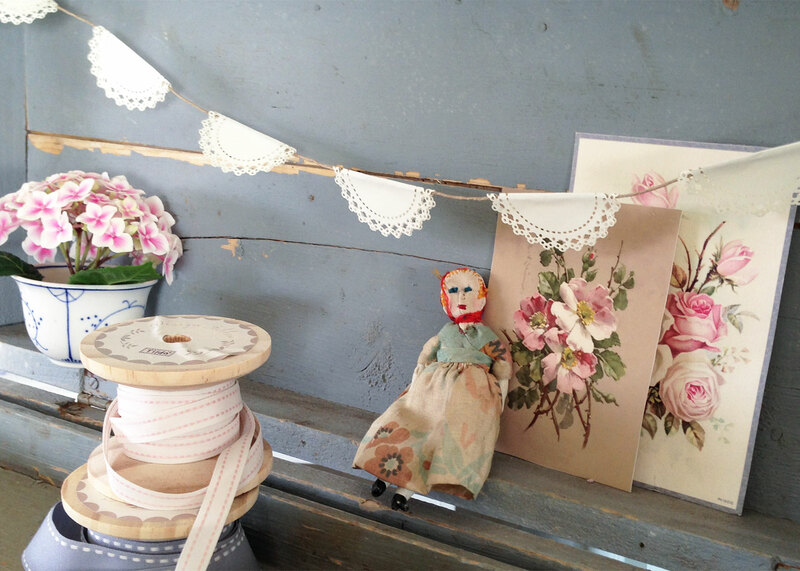 By pulling the thread a little as you quilt the quilt gets a vintage feel. If you feel the need to quilt more, perhaps a cross or a couple of hearts in each rectangle will do the trick. For the binding we suggest using one of the brown fabrics from the “All that is spring”collection, “Aurora Brown” or “Sally Brown”. If you don’t know how to bind a quilt there are a lot of Quilt Binding tutorials on YouTube. We just had winter holidays in Norway, and the tradition is to spend it skiing in the mountains. For Tilda there is no exception, and a small, but much loved Tilda “studio” can be found amongst snowy hills and pine trees, used not only in winter but as much as possible all year round. While most of the country enjoyed an early spring, we had more than enough snow. 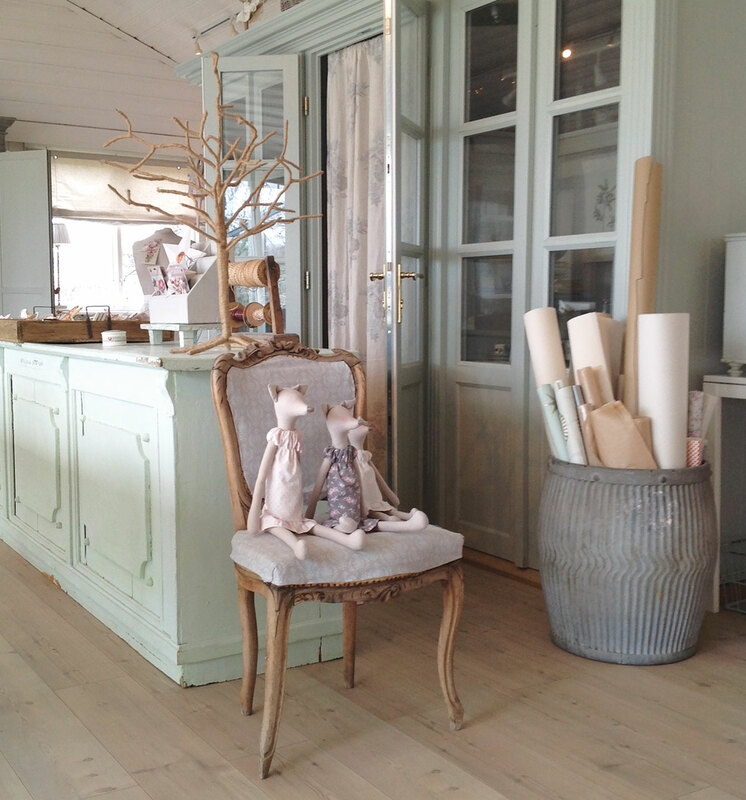 To the right you see a corner of Tilda’s little mountain studio, with old timber walls. What better way to spend the evenings than crafting in front of the fireplace, and even though it is snowy outside spring and Easter is soon upon us. Here are some ideas. 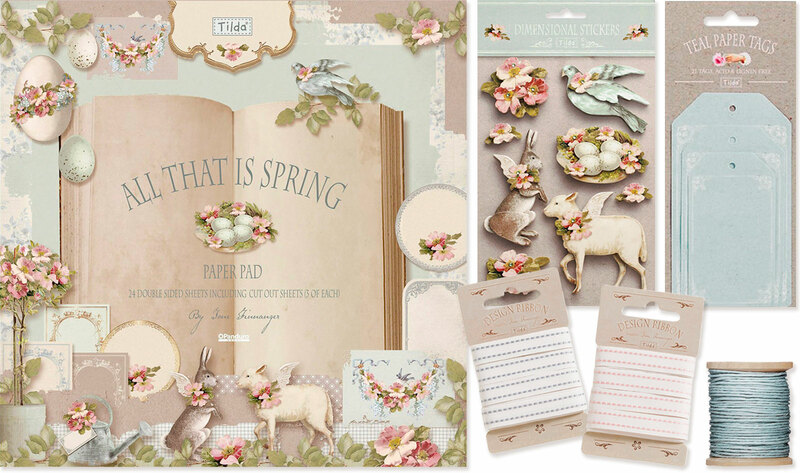 You will need: “All That is Spring” paper stack, ribbon, “All That is Spring” dimensional stickers, paper glue and a hole punch. You will also need something circular approx. 7 cm wide. A glass is often about that size. The measurements are according to a standard size scrapbook sheet. Fold a 2 cm edge along one side of the paper sheet that you want to use. This will be the flap used to glue the box together. Then fold the sheet double. Fold each half in the middle, so that you have four layers as well as the 2 cm fold, see figure A. Use the glass to draw a bow at one end of the folded paper. This will be the top of the box. The bow should not be more than 3,5 cm high. Cut the bow, and trim the 2 cm flap on the side. Fold all the bowed flaps, see figure B. The next fold will determine the height of your box. Unfold the sheet, and then fold across, creating the height you want. Unfold so you can fold the first folds back together. Cut 5 cm high flaps through all the layers for the bottom. Trim the 2 cm edge on the side, see figure C.
Use the flap on the side, and the bottom flaps to glue your box together. Punch a hole in two of the bowed flaps opposite each other, and use a ribbon to close the box. 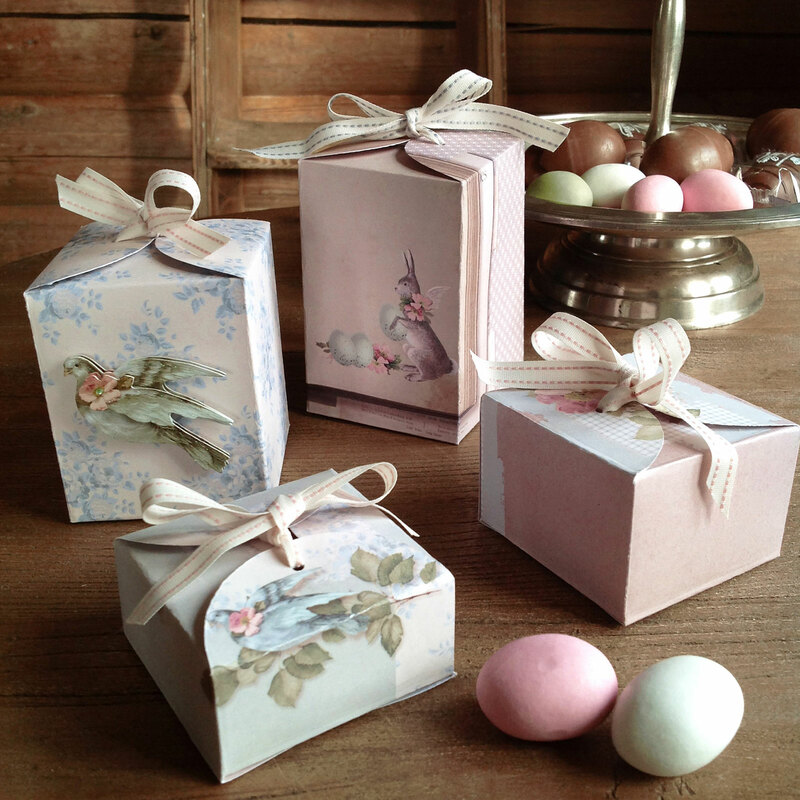 Simple spring and Easter tags made out of Tilda tags, scrap book paper, and dimensional stickers. The dimensional stickers already have glue pads on them, so this is super easy. 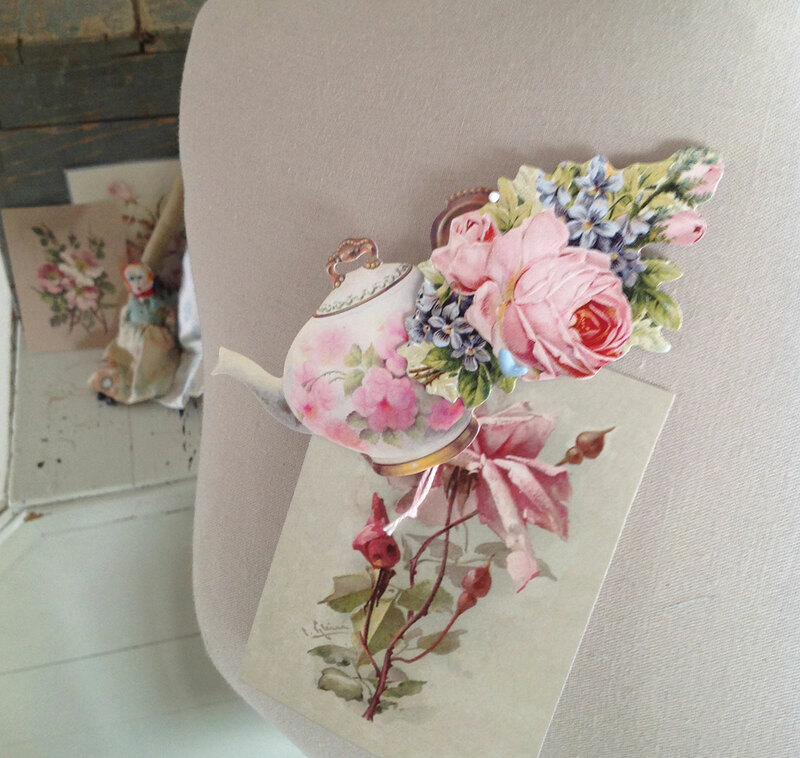 You can use Tilda tag as pattern for the scrapbook paper tags. 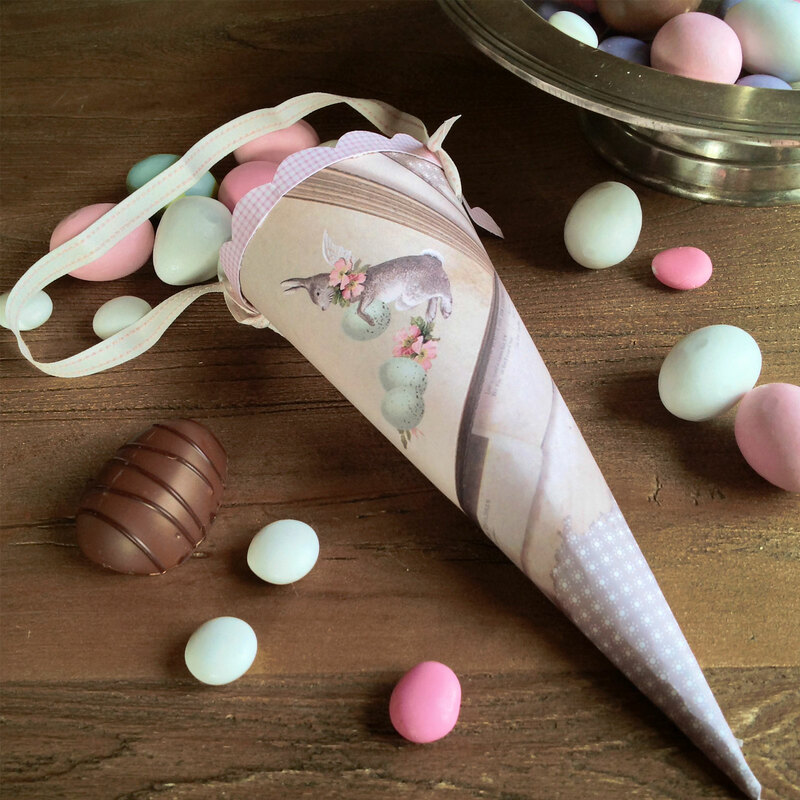 Paper candy cones are great for spring and Easter decor. Form a cone and glue together, trim the top. Cut a nice paper trim or use a lace to decorate the top. Punch a hole on each side of the cone for the suspension ribbon. If it’s difficult to get the glue to hold the cone together, you can staple the top together to make it stronger. All That is Spring Paper pad, All That is Spring Dimensional stickers, Tilda natural string on spool Mist, Tilda ribbon 10 mm Pink seams, Tilda ribbon 10 mm Blue grey seams, and Tilda Paper Tags Teal. 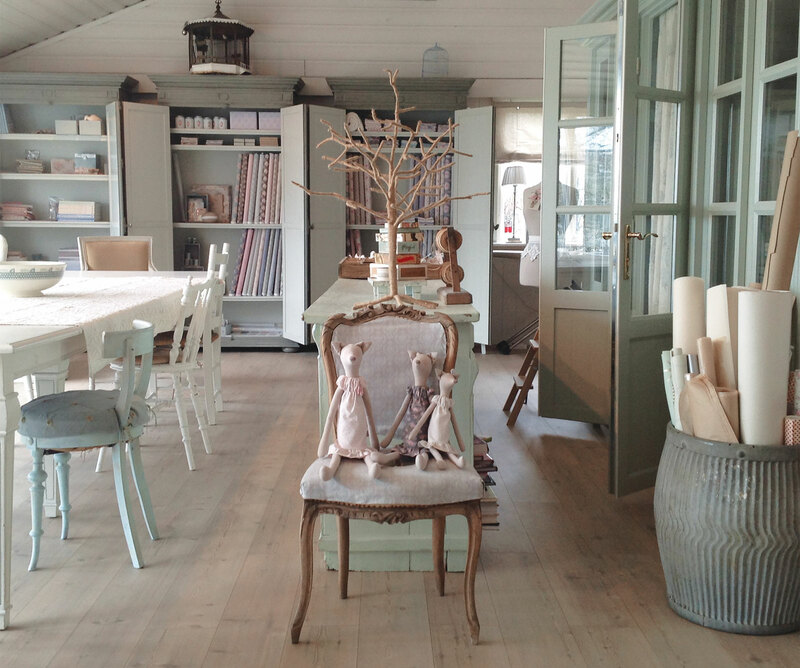 The Tilda studio is situated on a small island on the Oslo fjord in Norway, surrounded by water and nature. 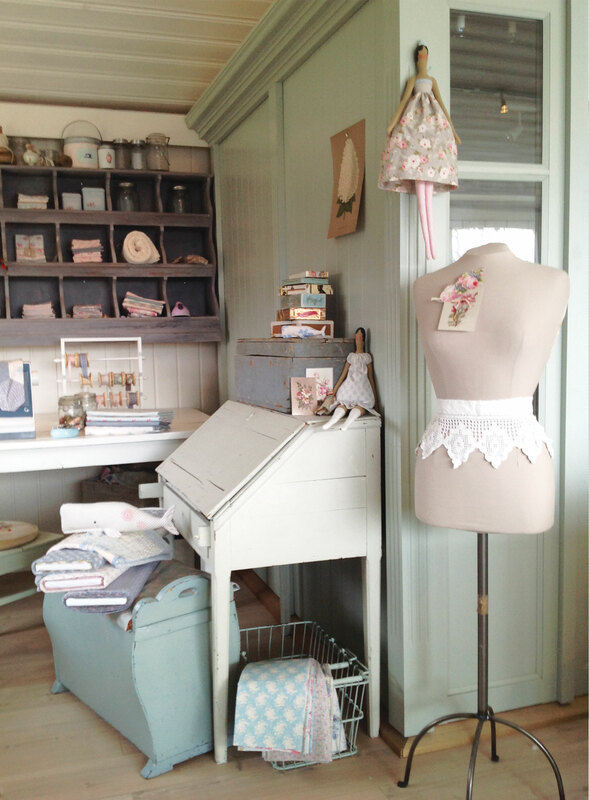 This is where we work with sewing, design and photography to create Tildas world. When we have visitors they stay in a neighbour’s garden cottage, and we eat on the local restaurant where the owners are good friends. It must be the best place on earth to work and live. Most of the time the studio looks like the pictures below, well, a bit messier perhaps… But when we photograph the whole place changes as we build scenes. 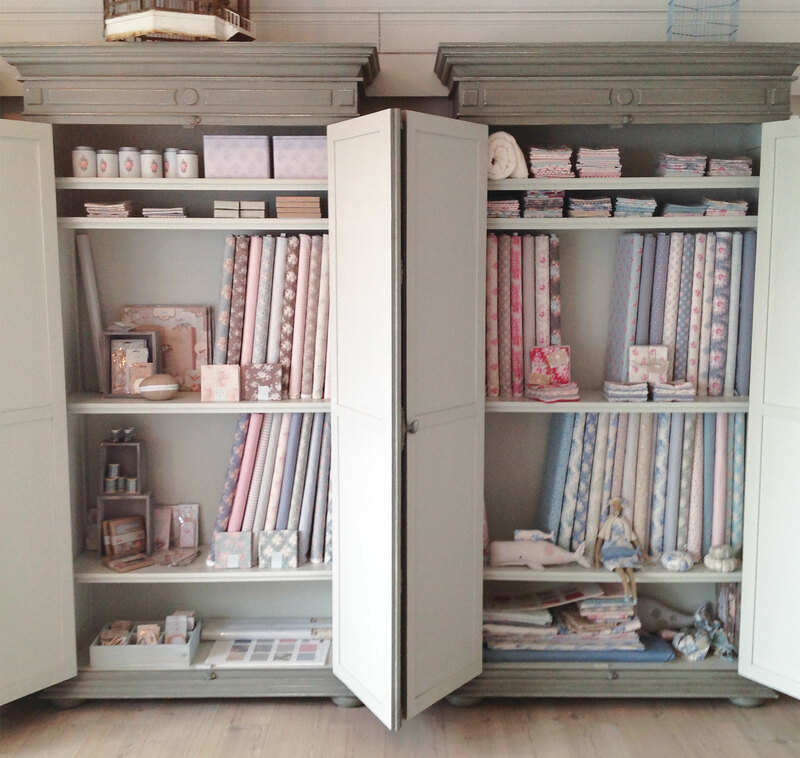 Large linen closets works well as shelve units for fabric and materials. 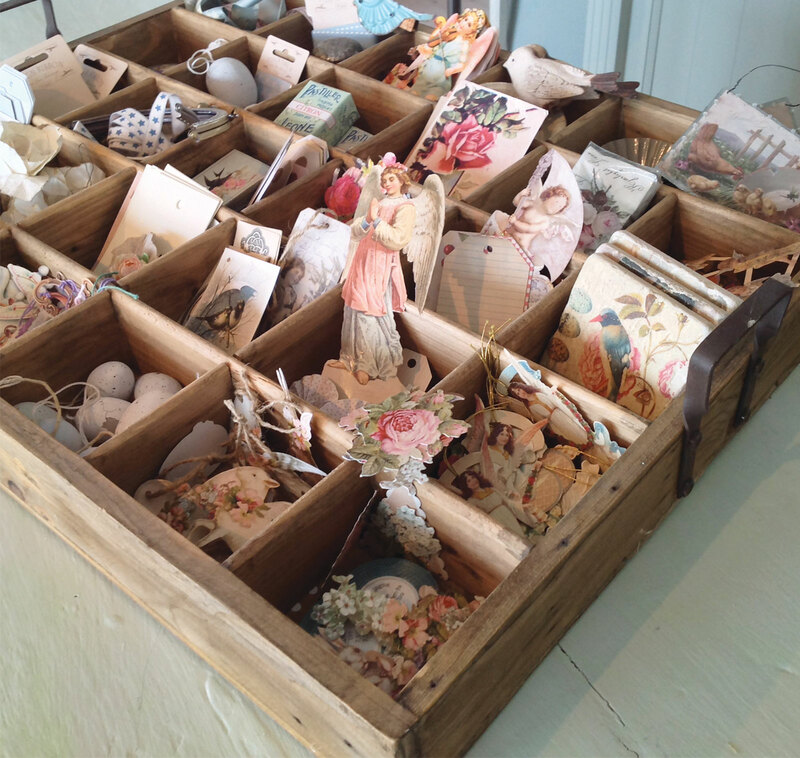 Strange sweet elements, like old scraps and labels is great inspiration. 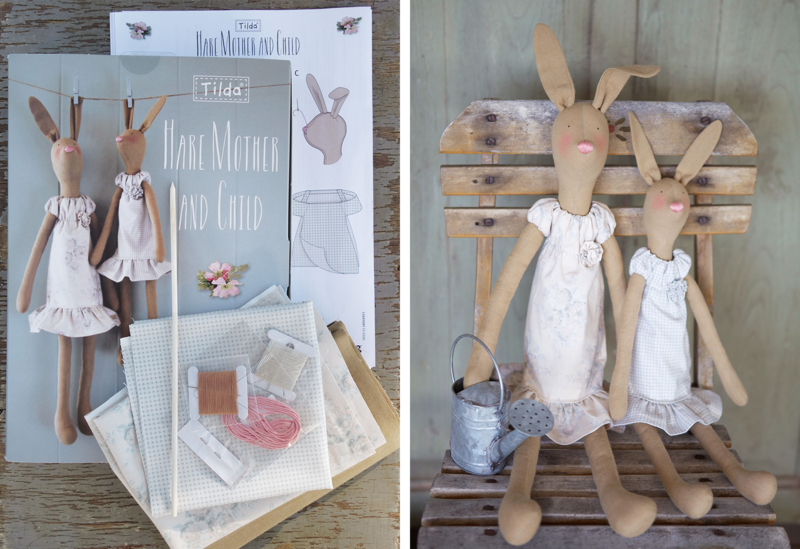 In the sewing aria models are made for all the Tilda books. 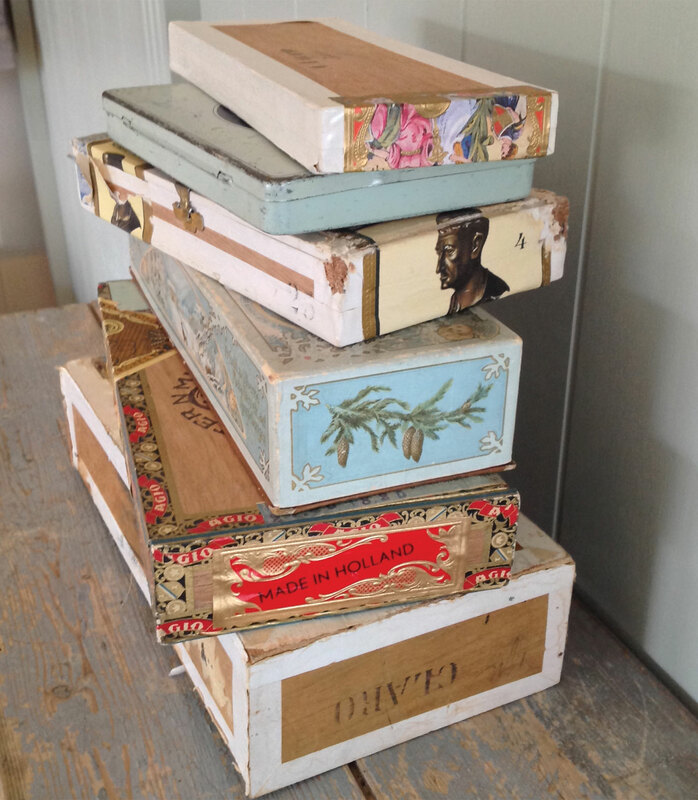 There is a lot of inspiration to be found in old cigar boxes. A copy room is built as a shop front for photography and exhibitions. The tree foxes are from the book “Tildas vintereventyr”/”Tildas fairy tail wonderland”. Grandmas charming old doll house-doll is a little treasure kept as a lucky charm. Here she is posing with a Tilda doll.